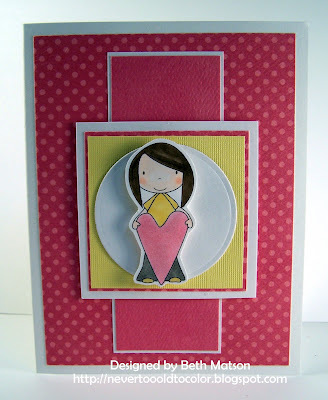 I'm so happy that I found the time to make a card for this week's Sketch Challenge on Splitcoaststampers. Here's a link to the sketch if you want to play. I pulled out the Bloom & Grow paper pack from My Mind's Eye and some Whipper Snapper Cling Mount sets by Anna Wight and came up with this card. Thanks so much for stopping by. I hope you're having a wonderful day. It's a cold one here today. The high for today is 30 and we got a new dusting of fresh snow last night so it looks like a beautiful November day but no . . . it's March and should be springtime. At least we aren't having the flood problems like the people near the Mississippi. My heart goes out to them. Clear and Simple Stamps will be releasing several new sets on April 15th and today I wanted to share a sneak peak of the Mom and Me set. For today’s project I would like to share this altered frame that I put together. I started with a small canvas frame that I found in the dollar section at Michael’s. I painted the canvas with a coat of Mod Podge and attached the designer paper. Once that had dried I painted another coat of Mod Podge over the top of the designer paper and then sprinkled some glitter into the wet Mod Podge. 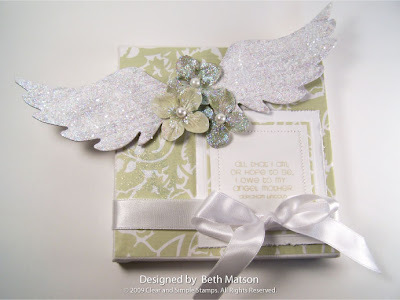 The wings are Tim Holtz Grungeboard that were painted with a Snow Cap Paint Dabber by Ranger. To apply the glitter to the wings I first coated them with a layer of Glossy Accents. I also added some glitter to the prima flowers and flat backed pearls for the flower centers. The message reads: ALL THAT I AM OR HOPE TO BE, I OWE TO MY ANGEL MOTHER – Abraham Lincoln. I sewed around the edge of the message and added some layers than wrapped a ribbon around the frame and now it’s ready to be put on the wall. 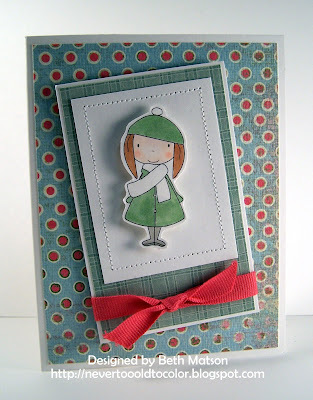 For today's post I'd like to share a card I made using Anna Wight's Wanted image from Whipper Snapper. Isn't that a handsome cowboy!?! I stamped the image on white cardstock using Dark Brown chalk ink and then sponged the cardstock with a layer of Vintage photo distress ink. I also ran my Distressing tool around the edge of the cardstock. The sentiment is from Anna's cling mount set 29 Again! also from Whipper Snapper. Thanks so much for stopping by. I hope you're all having a wonderful Monday. We're having freezing rain here today and there is no mention of sun in the seven day forecast but eventually spring will come to Northern Minnesota . . . I hope. I am having the best time with the Libby collection from Grab-A-Doodle-Do. Here are a few more cards using these fun downloads. Yesterday was the first day of spring and we ended up with an inch and a half of new snow. Today the snow is melting so maybe spring really is on the way. I hope you're all having a great weekend! Thanks so much for stopping by. I came across the cutest images the other day and have to share. Do you like digital downloads? Then check out the adorable collection at Grab-A-Doodle-Do. 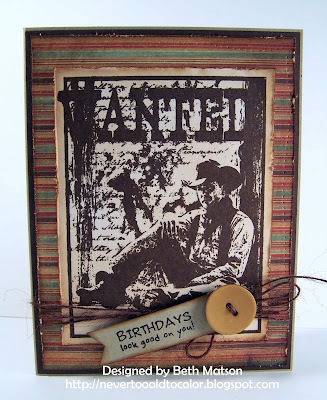 Here are a couple of cards I made using the Libby collection. Thanks so much for stopping by. I hope you all have a wonderful weekend! Just a simple set of cards using the Easter Basket set from Clear & Simple Stamps. Easter Basket is the Stamp of the Month and you can receive $1 off this set by using discount code: DTBlog309. Offer expires March 31, 2009. Thanks for stopping by. I hope you're all having a wonderful week. Just wanted to post a couple of St Patrick's Day cards and wish you all a Happy St Patty's Day! 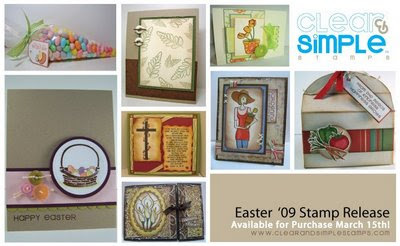 New sets available today from Clear & Simple Stamps! Today’s card features Clear & Simple Stamps Fresh from the Garden set that I sneak peaked yesterday. The set is filled with all kinds of fun vegetable images great for creating background papers and for main images. 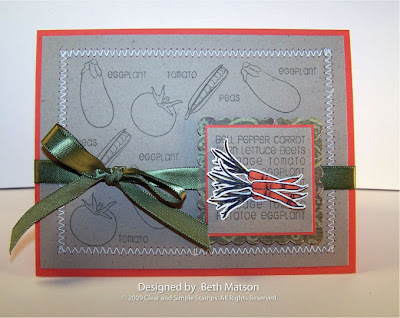 To create the background I just randomly stamped a variety of the images with True Thyme ink on Kraft cardstock then for the main image I stamped the carrots on white cardstock with black ink and colored them with my Copics to really make them stand out. They were then cut out and mounted with pop dots for some added dimension. Now the next time your neighbor drops off some fresh veggies from their garden you can present them with a veggie thank you. Happy Friday the 13th! I hope you all have a wonderful day. Thank you so much for stopping by. Attention gardeners everywhere – do you like to share your produce with friends and family? Well now you can package it up so it looks as great as it tastes. On Sunday, March 15th Clear & Simple Stamps is releasing a new set called Fresh from the Garden with all kinds of fun vegetable images. 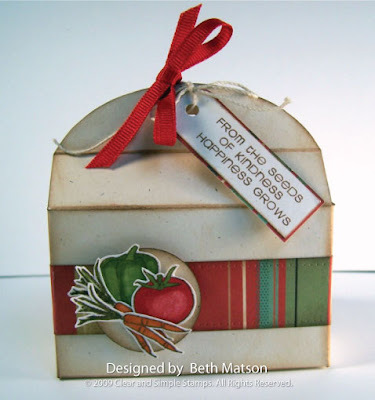 For my project today I decided to make a small little box great for sharing seed packets. I printed the template for the Wrap-Up box (see supplies list below for template details) and assembled as directed. Next I inked the edges with Vintage photo Distress Ink. For the strip around the box I used some Cosmo Cricket Mr Campy paper. The veggies were stamped in black and colored with Copics. I cut them out and mounted them to the circle with was then attached to the box with pop dots. Finally I added the little tag to the top with some twine and a nice red ribbon. What shall I share today? 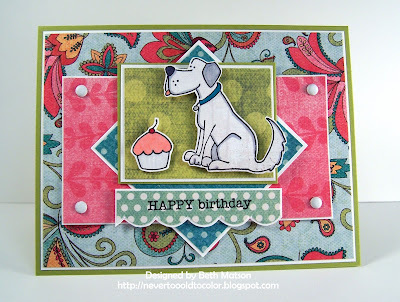 I have some more Whipper Snapper cards I would like to share and I also have another sneak peak for Clear & Simple Stamps so I think I'll do two posts today instead of one really long post. 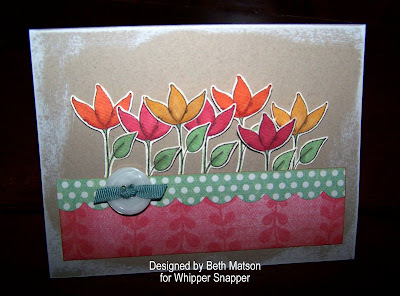 For the first post I will show you more Whipper Snapper cards using Anna Wights' cling sets. 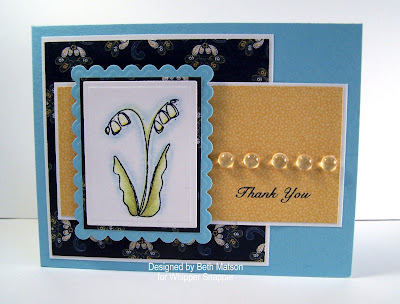 In the top card I stamped the stem and two flowers on cream and colored them with Copics. I also added a little Antique linen Distress Ink to the edges of the image panel and matted it with Kraft. The designer paper is Basic Grey Stella Ruby. 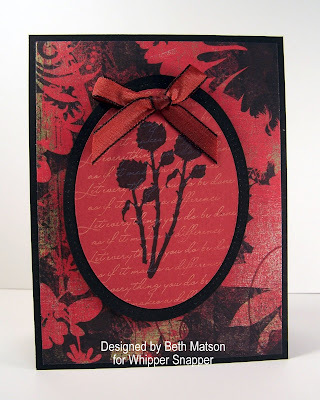 Next I pulled out the poppy flower and stamped in on the same cream cardstock and colored it with Copics. 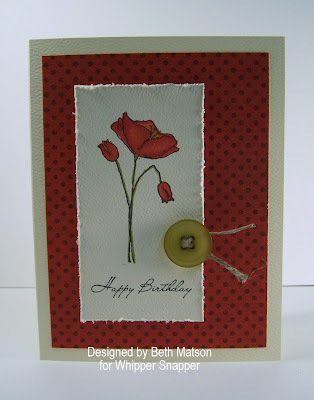 I kept this card layout very simple to focus on the flower. Instead of matting the image I ran my distresser around the edges. The patterned paper is from Bo Bunny. Finally I want to share this card I made a while back. When I received this set in January I knew I had to make a One fish, Two fish card so this is what I came up with. To create the saying I used Snap Stamps. The colors on this photo aren't nearly as nice as in real life but you get the idea. 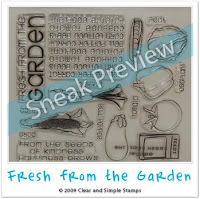 I'll be back later with a sneak peak of Fresh From the Garden from Clear & Simple Stamps. It will be released on the 15th of March. They were forecasting a blizzard for us late yesterday so after work I stopped and picked up a new package of My Mind's Eye papers in hopes that I could spend today in my craft room but the blizzard didn't amount to much (only about 6 inches) so no snow day for us. 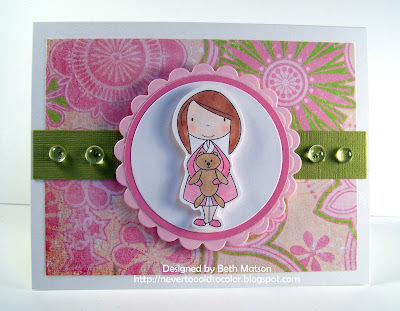 I did find time to put together one card last night using the new Bloom & Grow papers from My Mind's Eye. I also used the Blossoms & Butterflies set from Whipper Snapper. I hope you don't mind if I share a non-stamping related photo too. We had a visitor outside the window the other evening while we were eating dinner. Isn't she adorable?! I hope you're all having a great day! Thanks for stopping by. 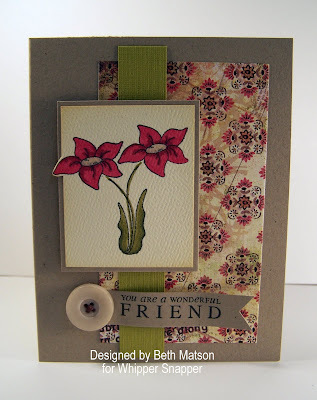 How about a couple of Whipper Snapper floral cards today? 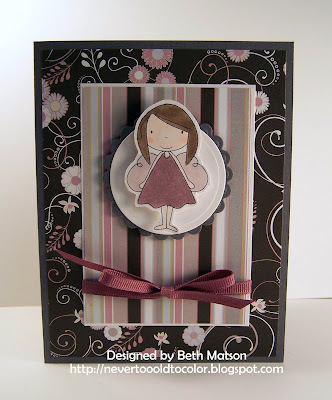 This first card uses the Blossoms & Butterflies set and the Blooming Expressions set both from Anna Wight. I stamped the flowers with Midnight blue Stazon and colored them with Prismacolor pencils and Gamsol. For the second card I stamped three of the thistles from the Wildflower Silhouette set in black ink on red cardstock and then repeatedly stamped the phrase 'Let everything you do be done as if it makes a difference' from the Blooming Expressions set with bisque Colorbox Chalk ink to create the background. I added some layers and a May Arts ribbon to finish the card. Anna has two new cling sets releasing on the 16th and they are adorable. Whipper Snapper has posted a sneak peak of them here. Thanks for stopping by. I hope you have a great day! A BIG thank you to all those who played along. 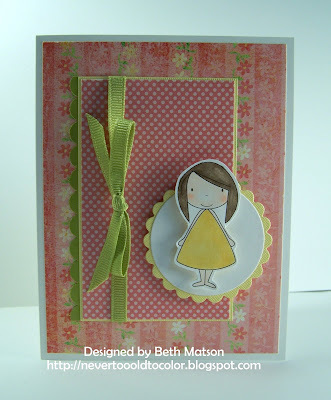 Clear and Simple Stamps blog. I love the new Believe in Words II set from Clear & Simple Stamps that will be released on March 15th. 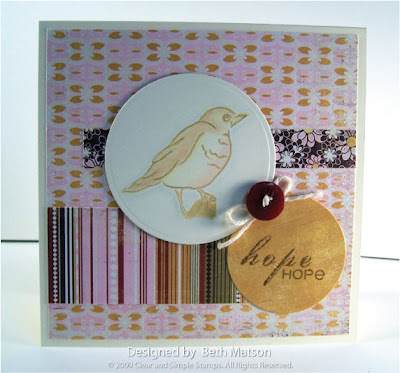 The cute bird on this card was stamped in scattered straw Distress Ink and then colored with Prismacolor pencils. All of the patterned papers are from the Sugared line by Basic Grey. For the finishing touch I added a button with a twine bow.